If you want to make a difference, and help community members in need, consider participating in The Giving Project. The Operating Staff Council (OSC) is hosting workshops as a way for NIU Huskies to give to others. Join some Huskies who are excited about creating practical and useful items for those in need while collaborating on ideas for projects. The next workshop is scheduled for 12 to 1 p.m. on Tuesday, Jan. 24 in the Glidden Room of the HSC. More information and other workshop dates are listed at www.niu.edu/osc. Come to one or all! Current staff, students and faculty are welcome, as well as NIU retirees. 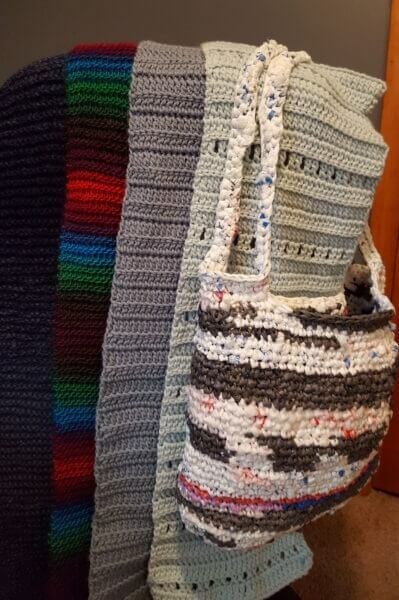 Bring a current project, a crochet hook if you want to learn how to crochet, or scissors if you’d like to make “plarn” (plastic yarn made from grocery bags that is used in making tote bags for students in need and sleeping bags for homeless people without shelter.) Yarn and plastic bags will be provided. RSVP to Pam Roesner at proesner@niu.edu or OSC at osc@niu.edu.